Today was the celebration for our top sellers of cookie dough. 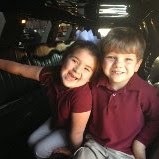 The students were treated to a Limo ride around town and a pizza party at Pizza Hut!! A very special thank you to all that helped make today a success!